A panel entitled “From Ferguson to Ayotzinapa to Palestine: Solidarity and Collaborative Action” was planned for Thursday, March 19 at the Missouri History Museum. Two days ago, the Missouri History Museum informed organizers of the panel that the Museum could not host the event unless the topic of Palestine and the participation of the St. Louis Palestine Solidarity Committee were removed from the panel. We, the undersigned, condemn this silencing of part of our community and this brazen attempt to divide communities of color. Instead of talking about solidarity, we find ourselves actualizing solidarity by rejecting the Missouri History Museum’s demands. We stand by our Palestinian partners and are postponing the original panel until an alternative location can be confirmed. 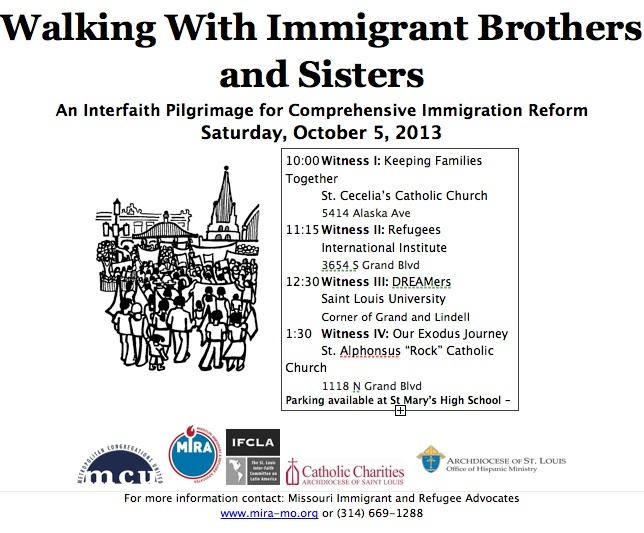 The panel is being organized to explore intersections among our distinct struggles. We are baffled by the decision of the Museum, a publicly funded institution, to censor discourse. The Palestinian narrative has for too long been silenced and needs to be heard. The St. Louis Palestine Solidarity Committee (PSC) was formed in 2009 by a group of grassroots activists in the St. Louis, Missouri area to respond to Israel’s devastating war on Gaza in the winter of 2008-09 and advocates for freedom from Israeli occupation, equality for Palestinians and Israelis, and justice for Palestinian refugees. We question what factors contributed to this decision to censor the panel. Shouldn’t an institution dedicated to intellectual inquiry and research be open to all viewpoints? Our conversations leading to this panel demonstrate that we have much to learn from one another. Our stories of oppression and resistance are understood by us all. We recognize the overlapping state and economic forces that contribute to our trauma. While our histories and struggles are unique, deep in our hearts we know that no one is free until everyone is free. This attempt to divide us hurts us deeply and must be condemned. We call on all people of conscience and heart to join us in telling the newly dubbed “Selective History Museum” that their decision to silence us is wrong and contributes to the deep racial divisions in St. Louis. Join us to tell the Museum that justice is not selective and solidarity means we must stand together. We invite you to join us on Thursday, March 19 at 7 pm in front of the “Selective History Museum” at 5700 Lindell Blvd, St. Louis, MO 63112 for a press conference and presentation of a plan of action to hold the Museum accountable for its shameful decision. El Panel llamado “Desde Ferguson a Ayotzinapa a Palestina: Acción Solidaria y Colectiva” estaba planeada para este jueves 19 de Marzo en el Museo de Historia de Missouri (Missouri History Museum ) ayer, el Museo de Historia de Missouri informa a los organizadores del panel en el Museo no podrá llevarse a cabo a menos que el tema de Palestina así como la participación del Comité de Solidaridad de Palestina en St. Louis (St. Louis Palestine Solidarity Committe fueran removidos del panel. Nosotros, los que abajo firmamos, condenamos el silenciamiento de una parte de nuestra comunidad y este descarado intento de dividir a las comunidades de color. En vez de hablar de solidaridad, nos encontramos ahora y en solidaridad rechazando las demandas del Museo de Historia de Missouri (Missouri History Museum.) Nosotros apoyamos a nuestros aliados Palestinos y estamos posponiendo el panel original hasta que encontremos una ubicación alternativa que podamos confirmar. El panel estaba organizado para explorar las intersecciones en las distintas luchas. Estamos desconcertados por la decisión del Museo, una institución financiada con fondos públicos, para censurar un discurso. El tema de Palestina ha sido por mucho tiempo callado y es necesario ser escuchado. El Comité de Solidaridad de Palestina en St. Louis (PSC) fue formado en el 2009 por un grupo de activistas comunes en el área de St. Louis, Missouri para responder a la guerra de Israel contra Gaza en el invierno del 2008 -2009 y aboga por la libertad dela ocupación Israelí, igualdad para los Palestinos e Israelitas, y justicia por los refugiados Palestinos. Cuestionamos que factores contribuyen a esta decisión de censurar el panel. ¿No debería una institución dedicada a la investigación y a la investigación intelectual a estar abiertos a todos los puntos de Vista? Nuestra conversación de llevar a cabo este panel demuestra qué todavía tenemos mucho que aprender los unos de los otros. Nuestras historias de opresión y resistencia son entendidas por todos nosotros, Nosotros reconocemos que las fuerzas estatales y económicas que soplan contribuyen a nuestro trauma. Mientras nuestras historias y luchas son únicas, en lo profundo de nuestros corazones sabemos que nadie es libre hasta que todos seamos libres. Este intento por dividirnos duele profundamente y debe ser condenado. Hacemos un llamado a todas las personas de conciencia a unirse a nosotros en la recién denominada “El Selectivo Museo de Historia ” que su decisión de silenciarnos está mal y contribuye a las divisiones raciales profundas en St. Louis. Únete a nosotros para decirle al Museo que la justicia no es selectiva y que solidaridad significa que debemos estar unidos. Te invitamos a acompañarnos el Jueves, Marzo 19 a las 6:30pm en frente del “Selectivo Museo de Historia” Localizado en el 5700 Lindell Blvd, St. Louis, MO 63112 para una conferencia de prensa y presentación de un plan de acción para exigirle cuentas al Museo por esta vergonzosa decisión. 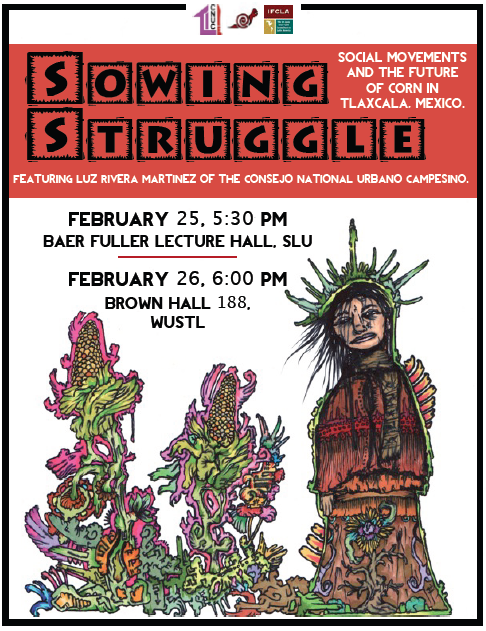 “Sowing Struggle: Social movements and the future of corn in Tlaxcala, Mexico” featuring Luz Rivera Martinez of the Consejo National Urbano Campesino (CNUC). Luz will speak about her 20 years of experience constructing autonomy, organizing outside the electoral system, and resisting genetically modified corn while protecting millennia-old varieties. Her talk will have important lessons for anyone interested in women’s, environmental, peasant, and labor movements. In the early 1990s, Luz established CNUC and has since worked tirelessly to demand government accountability, defend family farms, and build a strong community. The CNUC has a long history of disposing of corrupt leaders, democratizing the budget, coordinating community-driven infrastructure projects, including peoples’ history in education, and expanding access to healthcare. At a time when justice and human rights are at risk with free trade agreements, there is a growing need to support your local economy and fair production practices. ‘Buying local’ has become a nationwide trend, and with good reason. Communities are give and take, and if you are giving back to yours then you will get even more in return. By showing your community how important your local economy is, before you know it, community gardens and apparel and products made within your own neighborhoods could start appearing. There are several places here in St. Louis that have local produce and apparel available. One in particular is “The Foundrie”. The Foundrie was started up by two St. Louisians: Shelah McClymont and Elizabeth Hahn-Lawrence. Shelah receive her Degree in Fashion Merchandising and has her own jewelry line called ‘Destroyed by Design’. Elizabeth studied Design and Advertising at Southern Illinois University and has her own clothing and accessory line called ‘Just Liv’. They are now celebrating The Foundrie’s second anniversary in their current location at Chesterfield Mall. And, they have many reasons to celebrate! When walking into their store, not only will you find apparel handmade here in St. Louis, but products that have been ‘upcycled’ or ‘revived’. Upcycling is an awesome way to make use out of unwanted clothes and products. Instead of buying apparel or home décor items, you can take what you already have and make into something new! The store is divided up by designers, so you can take a look at their products as well as learn a little bit about them. You will find everything from jewelry to body butter to home décor. The Foundrie is also hosting some fun events in-store such as once-a-month B.O.Y.C (bring your own craft) nights where you can bring in a craft you are working on as well as your own drinks or food to share. The Foundrie also offers their own supplies to the guests if you are fresh out of ideas. It’s an interesting way to make crafty friends, take away new ideas and hang out in a really cool setting! Take a look at their website: http://www.thefoundrie.com and learn more about Shelah and Elizabeth, the work they are doing in their store and a description of the events they are hosting in-store. There is also a page on their website where you can find all of the designers they are currently featuring. For an opportunity to meet the ladies of The Foundrie as well as participate in a community event, check out Swap-O-Rama-Rama at the Missouri History Museum tomorrow from 12:00-4:00pm. Swap-O-Rama-Rama is a national event hosted by Creative Commons, a non-profit agency. The idea is to bring a bag of your own fabrics or apparel items and learn about creative ways to reuse and recycle them. There is also a community table where you can swap out your clothing for other items and create something with them. You can take the items you want to keep home or to the sewing rooms that will be set up where volunteers will help you create and alter your materials! Visit http://www.mohistory.org/node/8187 for more information.